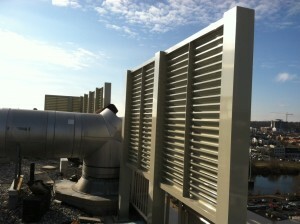 Custom louvers can offer completely unique benefits when compared to traditional physical barriers. If you’ve ever taken a long look at your commercial property and thought that you’d like to improve security, privacy, and the overall aesthetic of the area you’re working with, physical barriers are one such way to do all of that. However, there are acually quite a range of options out there, from the traditional fence, to the practicality of bollards, to something like louvers which aren’t as commonly seen. The benefits that come with custom louvers are unique and can be a compelling option for many. Below are some of our top reasons that you may choose to install custom louvers over other physical barriers. Sometimes, it’s important to just have an element of visual separation between spaces. It can help in keeping workspaces distinct and different from one another. Louvers are ideal for this, as they still allow for airflow and transmission of sound, meaning they can be used to separate outdoor work areas without actually making it feel like it isn’t outdoors. Custom louvers can also help distinguish your property from nearby ones, especially if you’re in a mixed development area where the line between commercial and residential can get blurred. Trying to add a certain visual element to make for a dynamic look? Custom louvers, with their aluminum construction and different options regarding colors, can often be a much-needed addition to otherwise drab looking commercial properties. The right louvers can add an air of professionalism to a property, too, and will make potential customers or clients realize just how seriously you take your work. If privacy is a concern, louvers may just be the answer. Compared to typical fences, you can block out much more visually and prevent any peering eyes from seeing what’s going on within your perimeter. Perhaps you’re working with designs or products that you don’t want immediately revealed to the public—using custom louvers can help establish a barrier between your intellectual property and anyone who may be watching. You may need to develop some control over who can access what areas in your building. Directing people to the right department or building isn’t always easy, even with all the right signs in place. Sometimes, you need visual cues like physical barriers to step in and do some of the work for you. When you are ready for quality louvers, the professionals at Hercules Custom Louvers are ready to help. For more information and to learn how we can meet your custom louver needs, contact Hercules Custom Iron online or giving us a call at 1-800-331-2590. We will ensure your investment serves your family for years to come! For updates and to see projects we’re working on, visit us on Facebook, Twitter, LinkedIn, YouTube, and Pinterest. This entry was posted on Friday, March 29th, 2019	at 2:59 pm	. You can follow any responses to this entry through the RSS 2.0 feed. Both comments and pings are currently closed.